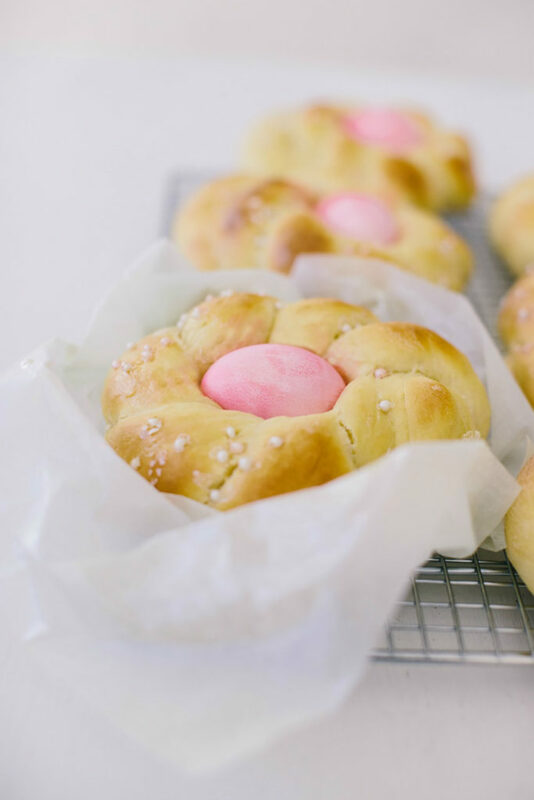 Tsoureki is the traditional bread of Easter in Greece and many other Christian countries. 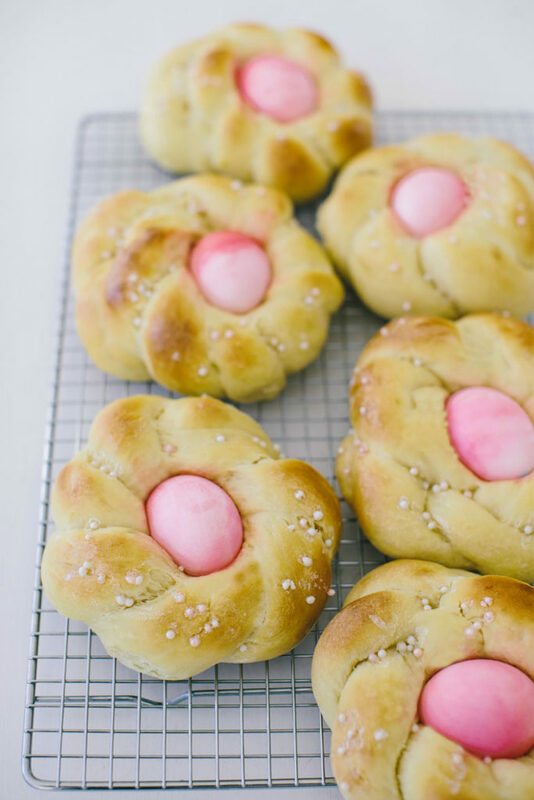 The dough is enriched and then twisted around brightly dyed eggs. 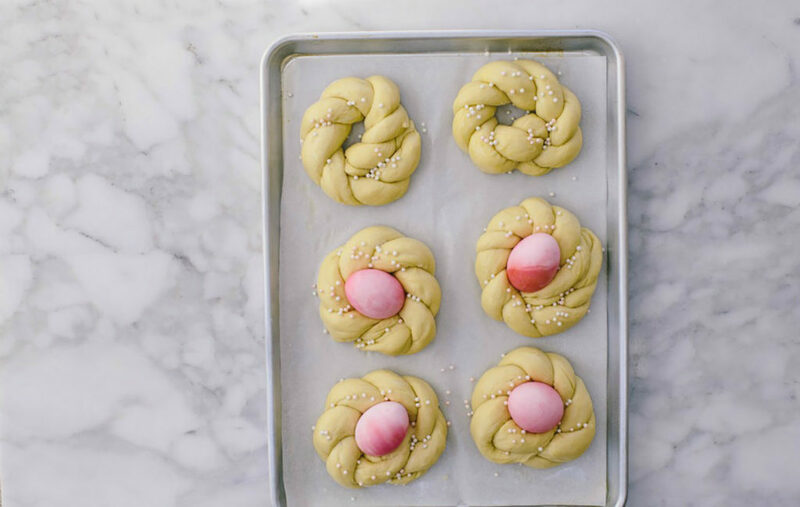 The bread is often braided with three strands to represent the holy trinity, formed into a circle as a reference to life and the eggs are dyed red as a symbol of Christ’s blood. The bread is sweet, flavored with orange zest and a traditional Middle Eastern spice called Mahlepi, which is made from ground cherry pits (the spice can be found in Middle Eastern or Greek markets). If you don’t have Mahlepi, you can make the dough with ground Anise seed or even Cardamom. We’ve made them individual-sized here, with light pink eggs, but you could make them any color you would like. Note: You will have more dough than needed here. You could make more individual rings, or save it for another recipe. Mix the yeast, salt, Mahlephi, orange zest, eggs, honey, and melted butter with the water in a 5-quart bowl, or lidded (not airtight) food container. Mix in the flour, using a spoon until all of the flour is incorporated. Cover (not airtight), and allow to sit at room temperature for about two hours. To dye the eggs: place 2 cups boiling water, 2 teaspoons vinegar and food coloring in a bowl. Drop the eggs into the dye (if the solution cools off, reheat it and continue with the other eggs). Make sure your eggs are well rinsed and dry before placing on the bread, so they don’t bleed color. Line a baking sheet with parchment paper. Take out 12 pieces of dough, each piece weighing 3 1/2 ounces. 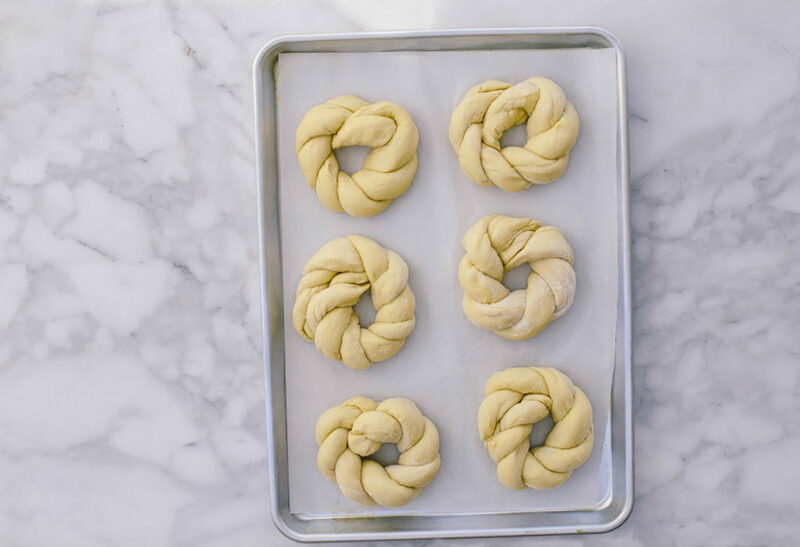 Gently roll each piece of dough to form a 1-inch thick rope about 13-14 inches long. 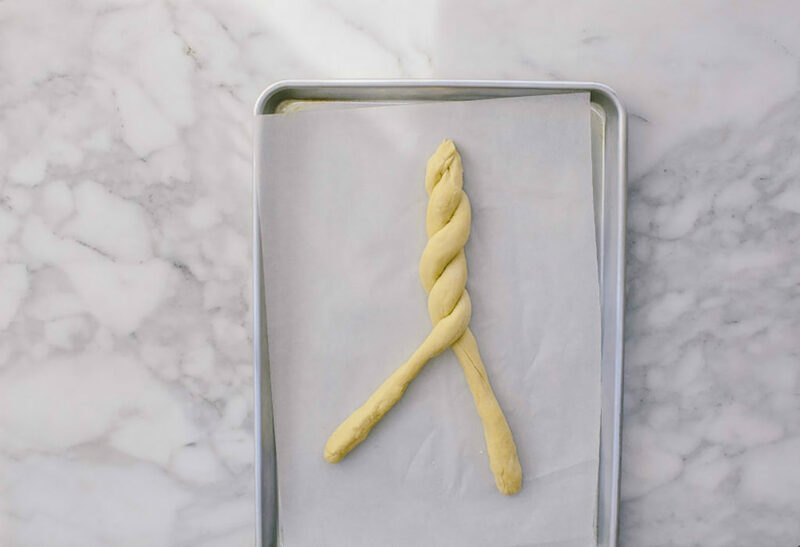 Take two pieces of dough and twist to form a braid. Pinch the ends together, and form the braid into a circle. Tuck the ends underneath and press them into the dough gently so they stay put during baking. Repeat with the remaining dough, making 6 rings total. Adjust an oven rack to the middle position and preheat the oven to 350°F. Place each dough circle on the prepared baking sheet. Cover loosely with plastic wrap and let rise until doubled, about an hour. Brush each circle with the egg wash, and then decorate each piece with sprinkles. 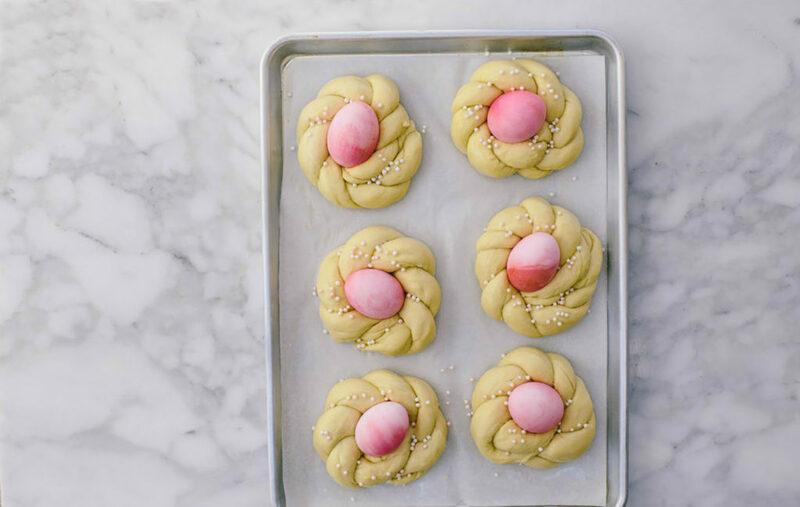 In the middle of each dough ring, gently place an Easter egg. Bake for 20-25 minutes until golden. Allow to cool on a wire rack before serving. Jeff Hertzberg and Zoë François met in their children’s music class in 2003 and have written bread cookbooks with more than 715,000 copies in print. Jeff, a doctor by training, is a self-taught baker who grew up eating great bread and pizza in New York City, and longed to recreate it himself. Zoë is a pastry chef and baker trained at the Culinary Institute of America. Her work appears in blogs all over the United States, and her dessert menus grace fine restaurants in the authors’ hometown, Minneapolis, Minnesota. Jeff and Zoë were among the very first cookbook authors to support their readers with personal responses on their website, BreadIn5.com, beginning in 2007, where they blog about their super-fast yeast breads.